Robin sadly died in July of 2018, following a short battle with cancer. 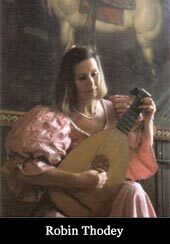 Robin was an internationally renowned lutenist and the featured artist on a series of four Rose Recordings CDs. Her numerous recordings sold briskly throughout the British Isles, United States, Europe, Australia, New Zealand and the Orient. Robin Thodey brings to her audiences the haunting and nostalgic lute music of the late 16th century England of Queen Elizabeth I. Such lute music was familiar in court circles of the time and is now attracting wide audiences throughout the world. She intabulated the Cello suites of J. S. Bach for baroque lute and performed these widely. The United Nations invited lutenist Robin Thodey to perform at the Palais des Nations in Geneva as part of its fiftieth-anniversary celebrations. The official U.N. concert also included Robin Thodey's poem "For The Peace of Our World". click here to read more. Robin Thodey taught in schools, colleges and universities across the country,and has also worked for the Gateshead Schools� Music Service teaching classical guitar. Her own tutor book has been critically reviewed in Classical Guitar Magazine, March 2012, and is the main source of teaching material for Gateshead.